Invasive Plant Patrollers start out at the Lake Stewards of Maine’s Introductory Invasive Plant Patrol training workshops. Below are instructions and field sheets used by Invasive Plant Patrol monitors. The goal of the IPP Certification Program is to encourage and support individual and group commitment to annual collection and submission of invasive aquatic plant screening survey data. 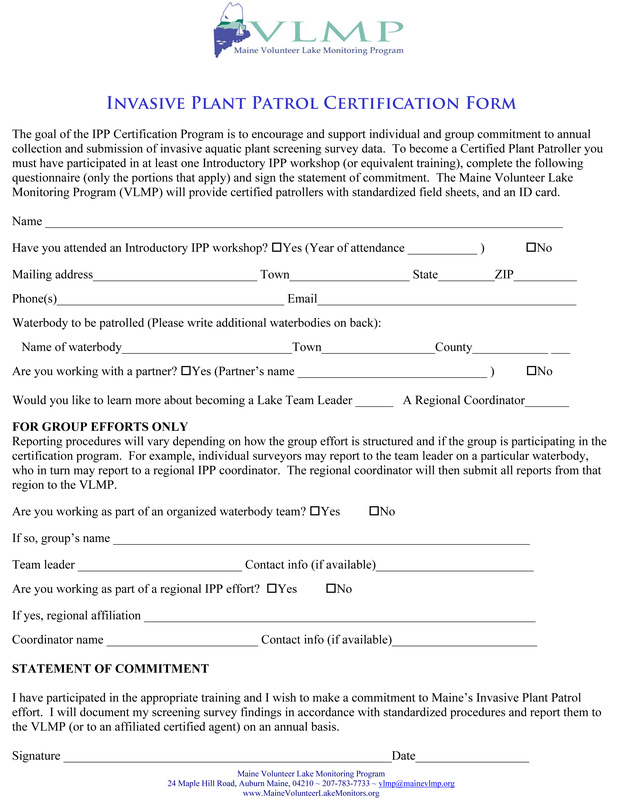 To become a Certified Plant Patroller you must have participated in at least one Introductory IPP workshop (or equivalent training), complete the questionnaire (only the portions that apply) and sign the statement of commitment. The LSM will provide all certified patrollers with standardized field sheets and an ID card. You’re individual Lake Page will help you find information about your lake, including water quality data, depth maps, volunteer lists and certification numbers, past plant surveys and a link to local weather. Search by lake or pond name, town name, zip code, or MIDAS number.